To me, the biggest difference between the Mendocino and Sonoma areas is infrastructure. 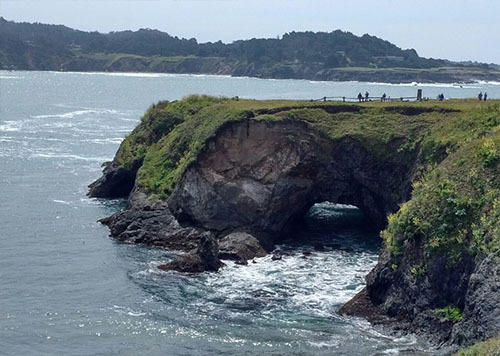 The Mendocino coast is chuck full of B&Bs, hotels, motels, restaurants, camp grounds, gas stations, Payless, McDonalds, Burger King, a couple of movie houses, three stage theaters, 2321 art galleries, 3 or 4 boat harbors, boat launches, and 2 full-service dive shops. By comparision, the Sonoma county dive areas have only a few B&B's and a couple of lodges (very expensive), 1 gas station (gas starts at $1.80/gal), 2 general stores, 2 relatively flat beaches for launching small boats, 1 boat hoist for inflatables up to 17', 2 commercial campgrounds, 2 restaurants, 2 public campgrounds, an "air" trailer (only in the summer), and 2 hot showers. IOW, pretty sparse compared with Mendocino. If you don't mind either rustic or painfully upscale, you'll be fine. There's very little in between. The drive to the Mendocino area is markedly different than the Sonoma coast. Most people take 128 through Booneville. It's a nice, winding drive through low coastal mountains and redwoods. Lots of new wineries along the route with free tasting rooms. By comparison, if you're heading to the Sonoma sites from locations south, the quickest route is through Petaluma and Bodega Bay. Once north of Bodega Bay, the road hugs the coast and is very winding. North of Jenner, the road still hugs the coast but adds some serious altitude. The first time through, it can be rather daunting. Very winding with sheer dropoffs. Definitely no mistaking it for Kansas. In terms of diving, both areas are similiar. There's very little difference in abalone populations. With a couple of notable exceptions, both areas are characterized by hikes to the entry points, cliffs, rocky beaches, and shore lines exposed to ocean swells. In the Mendocino area, the easiest and usually calmest entry is at Van Damme with Russian Gulch being a reasonable alternative. On the Sonoma coast, Stillwater Cove is the easiest entry and is fairly well protected. Alternately, there's north Fort Ross Cove which is usually well protected climbing to get to. These 4 locations are the most popular abalone sites and are somewhat similiar. Except for Van Damme. Van Damme is a place apart due to it's extremely easy access (flat with parking with 100 yards of the water), large size, the ability to get in there when everywhere else on the coast is totally blown out, the incredible number of ab divers hitting the place, and the fact that a good freediver can limit out 100 yards from the beach. Once you go beyond the very popular locations described above, I'd be hard pressed to differentiate the Sonoma and Mendocino areas. Mendocino usually has a little better visibility. Sonoma County has more ticks, Mendocino has more poison oak (based on personal experience). Other than that, it's pretty much 0.5 abalone per square meter from Jenner north beyond Fort Bragg. Starting north of Sonoma County's Russian Gulch (6 miles (?) north of Jenner), the popular dive sites are: - Red Barn South/Cardiac Hill - a very popular location due to the good shore picking. If someone dives this location, I wouldn't have a clue why and pretty much has lousy vis all season. But it is part of the third (?) largest reef off the California coast line and there are lots of abs to be found. NOTE - "Red Barn" is actually the first big WHITE barn you pass after leaving Jenner. It's about 12 miles north of Jenner (not too many barns of any type out there). Red Barn south is 1/4 south of the Red Barn. Red Barn north is 500 yards north of Red Barn. - Red Barn North/Pedotti Reef - also a very popular location due to the shore picking available. It's accessed through a gate directly west of the ranger kiosk for the Fort Ross Reef Campground. - Fort Ross Coves (north and south) - the north cove is very popular because it is well protected from the northwest swell. Parking is the Fort Ross main parking lot and you have to hike to your entry. - The Old Mill - is an area west and south of the point of land immediately before you get to the Fort Ross Store as you head north on at the shallower depths. It's also very exposed. But if you can work 25', the area immediately south of the washrocks is very productive. - Timber Cove - is a commercial campground. Somewhat "rustic" but it has one of the two hot showers on the Sonoma Coast (send $5 for the location of the 2nd hot show :). It also has the boat hoist. $21 to launch a boat with up to 3 people. $6 per person trespass fee above and beyond that. Kayaks don't count as a boat. Along the north side of the outer cove, abalone can be found at relatively shallow depths (15' to 20'). - Stillwater Cove - is the easiest access point on the Sonoma coast. This is where I usually launch a kayak to access some pretty spectacular freediving within a 15 minute paddle. Within the cove itself, a lot of people hammer the south side. It's relatively shallow (average is about 8') but it's also pretty picked over. On the north side of the cove, just beyond the first washrock, there's a ridge that varies from 8' to 25' deep. Every time I check that ridge, I start seeing abs in 15' of water as I'm heading toward Japan. So I'd suggest either the north side of Stillwater Cove or outside the farthest wash rocks on the south side of the cove. The hit 25'/30', the center of the cove 50 yards out is full of nice size abs. - "The Washing Machine" - is a cove about 100 yards north of Stillwater Cove. It can be accessed by swimming out of Stillwater or climbing down to a small beach. I understand the pickings are rather good because 1) the "cove" area is a jumbled bottom 5' to 12' deep and 2) it's sufficiently exposed that it's lumpy enough on most days to keep most divers out. The place spooks me and I stay away. But that's personal. It should be fine for strong divers smart enough to recognize marginal conditions. Unfortunately, way too many strong divers aren't that smart. - Ocean Cove - another commercial campground. They have a marginal boat launch. It's steep and long. And it sets you in Ocean Cove which is large and shallow with a couple of barely submerged rocks. Really exciting cove on days with swell over 6' and better. I've never dove the cove for abs. I'm also told it's a great night dive for crab. - Salt Point - is a state park. The Gerstle Cove marine reserve is where the fish & game wardens return all surviving abalone confiscated from reserve is carpeted by abalone and all of them are off limits. However, just outside the reserve on the north side, pickings get pretty good really quick. The south cove is also a popular ab dive site. - Fisk Mill Cove - is a long cove starting at Stump Beach and going north for a couple of miles. There are a number of access points along the highway and they all lead to good abalone diving. If you can see kelp on the surface, there'll be abalone below. - Horseshoe Cove - is north facing and not usually a friendly place to dive. But, at this time of the year, the swell swings from all directions. This is a good location when the swell is coming from the southerly quadrants. Kona’s underwater landscape is dominated by lava tubes, pinnacles, archways, and dramatic dropoffs, creating a myriad of habitats to explore. Come and explore it.